In the western Utah desert, the Telescope Array sprawls across an area the size of New York City, waiting for cosmic rays. The facility detects the high-energy particles that collide with Earth’s atmosphere constantly; the cosmic rays trigger the 500-plus sensors once every few minutes. While pouring over data in 2013, Telescope Array physicists discovered a strange particle signature; the photon equivalent of a light drizzle punctuated by a fire hose. The array had unexpectedly recorded an extremely rare phenomenon — gamma rays, the highest-energy light waves on the electromagnetic spectrum, produced by lightning strikes that beam the radiation downward toward the Earth’s surface. Five years later, an international team led by the Cosmic Ray Group at the University of Utah has observed the so-called downward terrestrial gamma ray flashes (TGFs) in more detail than ever before. The Telescope Array detected 10 bursts of downward TGFs between 2014 and 2016, more events than have been observed in rest of the world combined. 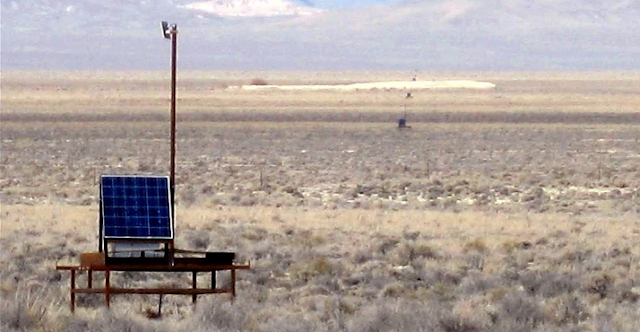 The Telescope Array Lightning Project is the first to detect downward TGFs at the beginning of cloud-to-ground lightning, and to show where they originated inside thunderstorms. The Telescope Array is by far the only facility capable of documenting the full TGF “footprint” on the ground, and show that the gamma rays cover an area 3 to 5 km in diameter. The study was published online on May 17 in The Journal of Geophysical Research: Atmospheres. The work builds on a study published by the group last year that established a strong correlation between similar bursts of energetic particle showers detected between 2008 and 2013, and lightning activity recorded by the National Lightning Detection Network. The physicists were stunned. The researchers brought in lightning experts from the Langmuir Laboratory for Atmospheric Research at New Mexico Tech to help study the lightning in more detail. They installed a nine-station Lightning Mapping Array developed by the group, which produces 3-D images of radio-frequency radiation that lightning emits inside a storm. In 2014, they installed an additional instrument in the center of the array, called a “slow antenna,” that records changes in the storm’s electric charge caused by the lightning discharge. Until a FERMI satellite recorded the first TGF in 1994, physicists thought only violent celestial events, such as exploding stars, could produce gamma rays. Gradually, scientists determined that the rays were produced in the initial milliseconds of upward intracloud lightning, which beamed the rays into space. Since discovering these upward TGFs, physicists have wondered whether cloud-to-ground lightning could produce similar TGFs that beam downward to the Earth’s surface. Previously, only six downward TGFs have ever been recorded, two of which came from artificially-induced lightning experiments. The remaining four studies with natural lightning report TGFs originating much later, after the lightning had already struck the ground. The array’s observations are the first to show that downward TGFs occur in the initial breakdown stage of lightning, similar to the satellite observations. “The downward-going TGFs are coming from a similar source as the upward ones. We safely assume that we have similar physics going on. What we see on the ground can help explain what they see in the satellites, and we can combine those pictures in order to understand the mechanism of how it happens,” said Abbasi. “The mechanism that produces the gamma rays has yet to be figured out,” added Krehbiel. The researchers have many questions left unanswered. For example, not all lightning strikes create the flashes. Is that because only one particular type of lightning initiation produces them? Are the scientists only seeing a subset of TGFs that happen to be large enough, or point in the right direction, to be detected? The team hopes to bring additional sensors to the Telescope Array to enhance the lightning measurements. In particular, installing a radio-static detecting “fast antenna” would enable the physicists to see the substructure in the electric field changes at the beginning of the flash. “By bringing other types of lightning detectors and expanding the effort, I think we can become a significant player in this area of research,” said Belz.